Serious mental illness (SMI) imposes devastating costs to a person’s life, impacting healthcare costs, education, work, and life expectancy. 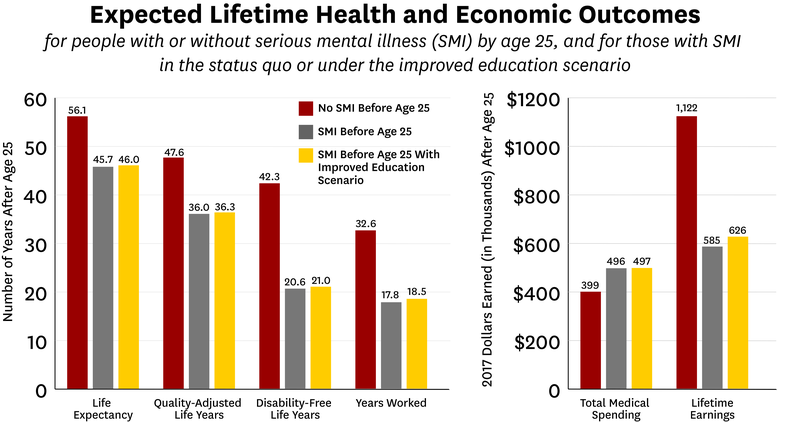 The individual economic burden of SMI is high, comparable to cancer and diabetes, and further exacerbated by the relatively young age of onset. Results of the simulations show SMI significantly worsens lifetime health outcomes, raises medical costs, and reduces economic outcomes. People with SMI by age twenty-five had an average life expectancy loss of over ten years and lifetime earnings $537,000 less than those without SMI by age twenty-five. The study results show that the economic burden of each new cohort of SMI patient experiences nearly a quarter of a trillion dollars in economic burden, and the simulated improvement in educational attainment would produce a reduction of over $8.9 billion. While such an intervention might be costly, the authors estimate a two-year educational intervention would produce a two-to-one return on investment compared to the cost of the intervention. The authors note that widely implementing the interventions necessary to spark increased educational attainment would require an investment in increasing behavioral health services. The mission of the Leonard D. Schaeffer Center for Health Policy & Economics is to measurably improve value in health through evidence-based policy solutions, research and educational excellence, and private and public sector engagement. A unique collaboration between the Sol Price School of Public Policy at the University of Southern California (USC) and the USC School of Pharmacy, the Center brings together health policy experts, pharmacoeconomics researchers and affiliated scholars from across USC and other institutions. The Center’s work aims to improve the performance of health care markets, increase value in health care delivery, improve health and reduce disparities, and foster better pharmaceutical policy and regulation.